Claim to Fame: Business blogger extraordinaire of Designing an MBA (formerly Crafting an MBA) and owner of Megan Auman jewelry. What I loved about it! What makes Megan’s e-book unique? Can I say the whole book? I had so many questions about wholesaling before reading this book but afterward all I have left is excitement! Not only was her insight extremely helpful and practical but it was honest. She makes sure you’re not underselling your beautiful products and explains how to avoid contract pitfalls. Her advice on trade shows is also appropriate for any show. It’s all about your display, your interaction with customers, and your professionalism. So even though I’m waiting one more year before I tackle a giant trade show, Megan’s tips are going to help me rock my holiday fairs! I know that all of us are getting into the holiday mode already but almost immediately after that, it’s trade show time. Stores start buying for the spring quarter as early as January and February so you need to get your line sheet ready and your pitch honed. Also, it’s never too early to start looking at summer trade shows since application dates are always months in advance. A little work during the holiday time could equal lots more money coming in during the slower months at the beginning of next year. 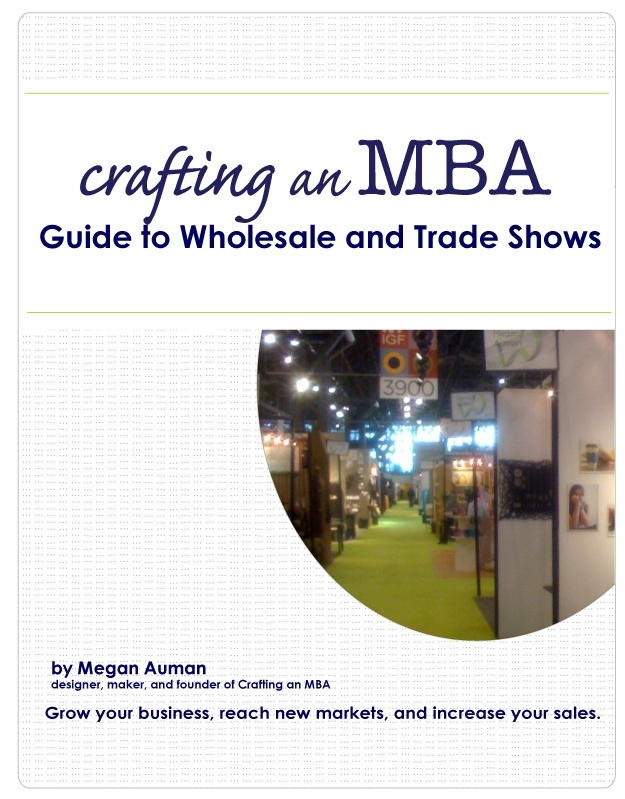 Megan’s ‘Guide to Wholesale and Trade Shows’ is an amazing resource to help you reach your 2013 goals of more stable income, more revenue streams, more exposure, and, most importantly, more fun! (Because who doesn’t think it’s fun to send their work out to shops in new states and new countries!) If you’ve ever wanted to get your work out in front of a larger audience, if you’ve ever wanted to find a niche shop that will make your products shine, and if you’ve ever wanted to add ‘trade show veteran’ to your list of accomplishments, then in all honesty Megan’s book is all you need. It has helped me create a line sheet I’m proud of, given me the guts to start looking at trade shows for 2013, and provided me all the juicy tips I need to rock my 2012 holiday shows. Are you ready to embrace wholesaling?